2 Museo Preistorico ed Etrnografico L. Pigorini and Museo Nazionale delle Arti e Tradizioni Popolari. 4 Convention Concerning the Protection of the World Cultural and Natural Heritage (UNESCO 1972). 3How does the Italian ministerial sphere function in relation to the 2003 Convention? How does the Italian state implement this convention? These are not easy questions to answer.6 It is difficult for common citizens and local entities to understand the functioning and purview of the various state offices managing the commonweal in the highly bureaucratized Italian state. The implementation of the 2003 Convention was entrusted to various state bureaucratic apparatuses that operate according to frequently obscure political and governmental modalities and do not engage in dialogue with the citizenry; most of the appointments and decisions are made through political and governmental channels that are not accessible or visible to the public. 4There are multiple bureaucratic structures in Italy for the implementation of UNESCO conventions: The most “dated” is the Italian National Commission for UNESCO (Commissione Nazionale Italiana per l’UNESCO), an agency of the Foreign Affairs Ministry, where the executive employees are appointed on a political basis. This entity was established in 1950, the same period as the founding of UNESCO itself, and, up to a few years ago (with the advent of the 2003 Convention), it was in charge of both World Heritage and the Masterpieces program. This work was conducted by a specific committee, the Committee for Intangible Heritage and Living Human Treasures (Comitato per il Patrimonio Immateriale e i Tesori Umani Viventi). It included representatives from the Foreign Affairs Ministry, the Ministry of Cultural Heritage and Activities (MIBAC) and various anthropological professions (Mariotti 2008a). By 1995, the Foreign Affairs Ministry had already established an unwritten agreement protocol with the MIBAC that entrusted to the latter all technical responsibility for overseeing World Heritage registration procedures. As a matter of fact, the constituency of the Italian National Commission included representatives of both the Foreign Affairs Ministry and MIBAC. 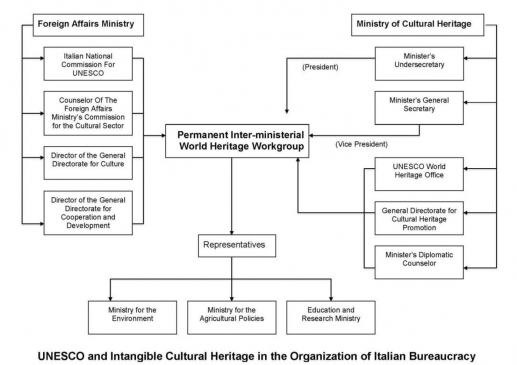 Following the agreement protocol between the two ministries, a Permanent Interministerial World Heritage Workgroup (Gruppo di Lavoro Interministeriale Permanente per il Patrimonio Mondiale) was instituted in 1997. This overtly political and strongly bureaucratized inter-ministerial organ included multiple ministries and was tasked with making decisions about the implementation of the 1972 Convention and, later, the 2003 Convention. Alongside this, an office called the UNESCO World Heritage Office was created within MIBAC in 2004, which currently oversees ICH nominations. The president of the inter-ministerial workgroup is the minister’s Undersecretary and the vice-president is the minister’s General Secretary. This is one of the highest administrative ranks within the ministry and also the person who signs nomination applications. The remaining membership of the workgroup is similarly a concentration of bureaucracy and politics: There is the minister’s Diplomatic Counselor, the Director of the World Heritage Office and the General Directorate for Cultural Heritage Promotion (also part of MIBAC), the Counselor of the Foreign Affairs Ministry’s Commission for the cultural sector, and the Directors of the General Directorate for Culture and of the General Directorate for Cooperation and Development, both of which belong to the Foreign Affairs Ministry. Lastly, there are representatives of the Ministry for the Environment, the Ministry for Agricultural Policies and the Education and Research Ministry. The workgroup’s political composition and existence is thus subject to the vicissitudes of the government; when an administration collapses, the workgroup must be reformed and, every time it is re-constituted, it is subject to new regulations. This means that a new minister may simply decide that the presence of a certain ministry within the workgroup is no longer necessary. These few details alone illustrate how difficult the management and implementation of the UNESCO conventions might be, considering the complexity of bureaucratic apparatuses and the conflicts over purview that can arise among them, as well as the workgroup’s overtly political rather than technical character. 5Starting in 2010, the workgroup began to define the forms through which the 2003 Convention would be implemented and the norms of its application. The situation is, therefore, characterized by emergent norms which have not yet been well defined. As a matter of fact, this organ has only made a few decisions thus far: The creation of a national list of ICH that would effectively account for the Italian situation; the possibility of presenting theme nominations bringing together multiple localities; and, finally, the decision to limit the number of applications presented each year in Paris to two, in contrast to the numerous applications presented the year before. 6Seeing as the workgroup is political in nature and does not include any recognized anthropological expertise,7 it is easy to image how the execution of the 2003 Convention in Italy has more to do with the sphere of politics than that of culture. In fact, the interpretation of the Convention that prevails in the bureaucratic practices differs from that of UNESCO and focuses, above all, on visibility and prestige in the sphere of Italian “culture,” forms of “excellence,” and the appeal of “great Italian culture” and intangible “Made in Italy” products in relation to tourism. Through statements by its directors, the National Italian Commission for UNESCO has repeatedly demonstrated that it interprets the 2003 Convention politically rather than, according to the UNESCO intentions of “giving voice,” to community, individuals and non-elite forms of cultural diversity originating in local areas. Among the various manifestations of intangible heritage, forms of knowledge and crafts connected to traditional artisanal production, the characteristic traditions of Italian artistic trades can and should be recognized as part of this category of heritage. These include, to name only a few, the lute-making tradition of Cremona, Murano glass-making, Florentine leather-working, and the extraordinary food and wine-making traditions that live on in every Italian region. […] In Italy, the creative craftsmanship that has combined technique and creativity, rigor and talent, precision and imagination at all levels has given life to the outstanding excellence of Made in Italy that forms the foundation of the whole of Italian exportation as well as our national market. In a country that cannot compete in terms of natural resources or heavy industry with global giants, with German steel mills or Arab and Norwegian oil, with African mines or the Chinese workforce, the population’s industriousness and creative genius have produced a form of excellence that is recognized throughout the world. For all its economic significance, this excellence goes beyond economics to simultaneously incorporate and express the main facets of Italian identity. In the Italian city of Florence, there is a certain way of producing shoes because this country has a specific aesthetic taste and a specific history; it is the home of Michelangelo and Raphael. To say “Made in Italy” means to define Italian production as a form of production capable of incorporating a highly aesthetic dimension into materials and products that then leads to the perception of a high quality of life. 8The very decision to reduce nomination attempts to two per year has the effect of “selecting” and more closely “scrutinizing” what is nominated, thus augmenting competition among the various prospective localities and between these localities and the organs of the state. In this way, the Representative List becomes a “display window” highlighting the best examples of “great Italian culture,” of an elite selection; it becomes a form of cultural property that the state proudly displays to the world but in relation to which, local communities fade into the background. An exemplary case of this was the “ministerial” nomination of the Mediterranean Diet, which was included in the UNESCO list in 2010.9 This process is especially visible in the field of cataloguing, where tensions between the state’s various bureaucratic apparatuses and its interpretation of the convention appears most clearly and overtly. 9In the field of Italian national cultural policies, much of the state’s interest in ICH has been focused on inventories (catalogazione in Italian). This interest is not a product of the Italian ratification of the UNESCO convention but, rather significantly, preceded it: Its emergence coincided with the gradual, laborious process beginning in the late-1970s, through which the Italian state began to grant recognition to local and regional cultures within the sphere of cultural heritage. This recognition led to the development of a new type of national heritage called (tangible and intangible) “demo-ethnoanthropological” heritage. The phrase “demo-ethnoanthropological” emerged in the mid-1970s thanks to the anthropologist Alberto Mario Cirese (1973), who used it to convey the plurality of Italian academic traditions: “demologic” studies of folklore and popular culture, ethnological research on cultures outside of Europe, and cultural-anthropological approaches in the North American tradition. This form of the expression, “demo-ethnoanthropological,” was adopted by the Italian state at the moment when cultural resources were first defined and recognized at the legislative level. This occurred firstly in the Legislative Decree of 199810 and subsequently in the 2004 Code of Cultural and Landscape Heritage (Codice dei Beni Culturali e del Paesaggio) released by the Ministry of Cultural Heritage and Activities (Bravo and Tucci 2006).11 In reality, the legislation does not specifically define what is meant by “demo-ethnoanthropological resources” and only makes vague reference to something that “betokens civilization.” ICH is similarly not yet formally recognized in legislation; however, cultural heritage cataloguing (including intangible ethnoanthropological forms) has a noteworthy history in Italy prior to the UNESCO convention. 10Although the Italian state shows less interest in ICH cataloguing than it does in cataloguing more traditionally consolidated heritage forms (artistic or archeological works, etc. ), the state’s interest in cataloguing ICH does reflect a more general investment in cataloguing every type of cultural heritage recognized as cultural property. In 1975, immediately after the formation of the Ministry of Cultural Heritage and Activities, this interest gave rise to a special institute (the Central Institute for Cataloguing and Documentation, or Istituto Centrale per il Catalogo e la Documentazione [ICCD]) established especially to catalogue the state’s cultural heritage. All types of cultural heritage that the state currently recognizes (historical-artistic, archeological, landscape, demo-ethno-anthropological assets, etc.) are, therefore, theoretically subject to a systematic process of cataloguing carried out by this institute. 11The cataloguing of “demo-ethno-anthropological” heritage, therefore, has a specific history within national cultural heritage policies, and over the years, has produced two forms for cataloguing: A form for tangible demo-ethnoanthropological heritage (Beni Demoetnoantropologici Materiali or BDM) and one for intangible demo-ethno-anthropological heritage (Beni Demoetnoantropologici Immateriali or BDI), both of which were introduced in 2000 and are still currently in use. 12These national forms were developed according to a classificatory and bureaucratic conception of cultural heritage that was applied in the same way to all types of resources and all cultural heritage cataloguing activities. As a matter of fact, with the necessary modifications to reflect the kind of heritage in question, the same type of form was used for the entirety of Italian cultural heritage in order to produce consistency (read: standardization) among the various kinds of heritage and the language used in the cataloguing forms. Different types of heritage were thus “translated” into types of forms that were different yet standardized. Through the technical and administrative language used in the forms, the process of cataloguing ICH in Italy has produced a domestication of the heritage and “appropriation” at the national level. 13The introduction of these forms marked an institutional acknowledgement of anthropological expertise in that the state recognized the professional proficiency of anthropologists for the first time. Only those anthropologists holding certified academic qualifications and experience in the field of ethno-anthropological documentation are eligible to do cataloguing work at either ministerial or regional levels. At the regional level, the procedure for recruiting anthropologists has varied from region to region. In Lazio, for example, public rankings were developed that were only open to degree-holding anthropologists with a specific background. 14However, these forms were strongly contested by the anthropologists who displayed a more critical approach in relation to questions of heritage.12 For this reason, the forms have retained a marginal position and never enjoyed widespread support within the Italian anthropological community. 14 The form is divided into paragraphs, fields and subfields. 15In its design, the BDI form appears to be a distant bureaucratic tool, reminiscent of the “bank-style census” that De Varine (2002) discusses in relation to the various types of cataloguing forms. The BDI form not only forces cataloguers to objectify a complex event by reducing it to a standard that shares the same homogenous language with other types of heritage (each asset has its own general cataloguing number that is unique at the national level), but it also functions to fragment complex events, such as rituals, into multiple separate forms (kinetic behaviors, songs, specific forms of knowledge, individual ritual moments, etc.). Each of these elements is to be considered a single “asset;” for instance, if a feast takes place over several days and consists of multiple moments and various ritual subevents (the blessing of animals, food preparation, proxemic behaviors, etc. ), the form forces cataloguers to produce one form for each “asset” represented by these individual elements, although they are then reunited in a form field in which all sub-events can be identified as components of a single main event.13 Another element that illustrates the strongly bureaucratic character of the form is the fact that each field in the form14 is identified with a specific code; this literally codified language contributes to making the form into a bureaucratic tool detached from any concrete cultural practice. 15 For an article regarding ICH cataloguing in Italy, see Broccolini 2010. 16 Es. Bianco and Del Ninno 1981, Mazzacane 1985. 18Until the current moment, these ICH inventories have been produced in Italy by the ministry (ICCD) or by local (regional or provincial) agencies without any attempt to share or give back to the individual communities involved. Over the last few years, any project the state wished to finance on this subject has been carried out without interference: The state decides on a cataloguing campaign and sends “its” own “bureaucrats,” anthropologists, to “withdraw” samples of “heritage” in order to preserve the memory of a piece of cultural property for posterity in its own national archives, according to a conservation-oriented conception of heritage. 20The arrival of the Representative List instrument within national policies has triggered a great deal of commotion at the local level and interest on the part of those who saw these lists as a potential global display window to grant visibility to the community and build political consensus. This instrument has also led the state (through its various ministries represented in the inter-ministerial work group) to enact a process of filtering and inspecting the nominations, thanks to a national right to cultural property.18 This dynamic found expression first of all, in the bureaucratic field of cataloguing, and secondly, in the field of preparing and presenting the nomination dossiers. 21Along with the emergence of these nominations and in compliance with Article 12 of the 2003 Convention, that required the state to catalogue intangible heritage, the inter-ministerial workgroup and the MIBAC World Heritage Office forced the “communities” proposing the nominations to fill out the inventory for their own nominated heritage as a preliminary requisite for presenting the dossier. The state did not, however, allow the individual communities to choose how to fill out the cataloguing forms but rather, following the Italian bureaucratic tradition of cataloguing, dictated that the inventories be created according to the national cataloguing standard, that is, using the BDI forms. 23This function becomes evident if we examine the bureaucratic dynamics surrounding the process these inventories must go through before the communities can move forward with their nomination applications. First of all, even though these inventories are promoted, commissioned and financed by the communities, they must be created by professional anthropologists trained in cataloguing; actors who are competent but often outsiders to the community in question. Secondly, all the procedures related to filling out the forms involve numerous obligatory steps that must be checked by the state (the ICCD must provide the general cataloguing numbers for each form and the codes for supporting audio-visual documentation). Above all, it is the state that holds the authority to check the forms and the progress of the nominations. In fact, the nomination must be reviewed and approved by functionaries of the state, which can approve or block a nomination and thus retains ultimate authority over the cataloguing process. 24The state with this bureaucratic procedure retains control over a great deal of the nomination process; however, the individual communities have, nonetheless, been able to enter into the heritage arena, as had previously occurred in relation to World Heritage. As a result, during the past year (2010-2011), every one of the towns presenting nominations (there were 11 nominations in Italy in 2010) was required to inventory the heritage in question. Thanks to the fact that the communities specifically commissioned the work and were directly interested (in the validation of their nomination and a UNESCO recognition of their heritage form), for the first time in national history, cataloguing has begun to move “downhill:” From the ministry and regions to the municipalities and individual nominating subjects, who became both commissioners and owners of the inventories, as well as of the audio-visual documentation supporting the forms. Paradoxically, however, this democratic process of cultural appropriation was triggered by the way that the nominating subjects were forced to adapt to a bureaucratic procedure imposed by the state and its interpretation of the convention. 25As one might imagine, in moving between a bureaucratic state-based centralism and the beginning of a grass-roots participatory process, this entire procedure expresses both the state’s need to adapt to “global values” of participation and democratization in cultural policy and its discomfort with and efforts to manipulate these same values. This ambiguity is clearly illustrated by the ethnographic exploration of a specific nomination (and inventory) case, that of the Palio of Siena (par. 7), for which I directly oversaw the cataloguing component. 26In response to the centralization of governmental policies about ICH and the often ambiguous way they have been interpreted by some state apparatuses, in recent years Italy has also witnessed the development of a movement of nongovernmental organizations (NGOs) with UNESCO ICH accreditation that are connected to local territories and communities. They have emerged in response to the excessive politicization and bureaucratization of the cultural heritage policies developed to implement the 2003 UNESCO Convention and to the lack of appropriate scientific and local geographical expertise within the ministry. Encouraged by guidelines from UNESCO itself, this movement is beginning to build an intermediary network with the state to manage and promote ICH policies along UNESCO lines. 20 See Clemente and Candeloro 2000. 27This movement has its roots in a fertile ground of associational activity, as well as cultural and political militancy that since the late-1960s has been connected to the folk revival movement and the cultural and political activism of leftist groups guided by popular culture and folkloric values (music, performative rituals, collective memory, oral sources).20 On the one hand, this marked pluralism was produced and stimulated by the state’s lack of interest in popular culture (which was later defined “demo-ethnoanthropological heritage”), while on the other hand, it revolved around countercultural and anti-hegemonic political aims. This pluralism continued to exist locally even in subsequent years, during the 1980s and 1990s, and gave rise to numerous efforts to valorize and document popular culture as well as museography and research projects. 28Later, when the UNESCO Convention, ICH and nominations for the Representative List started to attract local communities and enter onto the Italian cultural scene, there was already a fertile ground rich in associations of both experts and militants who were prepared to implement the logic of the convention in dialoguing with local communities and territories and to give life to a movement in reaction to governmental policies, although, nonetheless, in engagement with them. To identify and monitor ICH on a regional and provincial level. They appear to be most concerned with locating cataloguing procedures implemented by the state alongside forms of “participatory inventories” built through dialogue with the communities and which complement the national inventorying projects regulated by the ICCD system. To offer support to MIBAC’s World Heritage Office in handling the nomination applications in a way that engages with the network and grants each region knowledge “from the ground up,” in dialogue with the local communities. To plan and test out documentary analysis procedures that follow international standards based on the language of the web and which complement the already existing national catalographic documentation systems (ICCD). To launch a multinational nomination pilot project dedicated to improvised poetry. This project seeks to develop the process of intercultural dialogue that began with the maritime Transborder France – Italy IN.CON.T.R.O project, an initiative that puts into dialogue several communities holding this form of oral heritage (Tuscany, Lazio, Sardinia, Corse, Cataluña, Balearic Islands, Tunisia, Morocco, and Brazil). 31The nomination for including the Palio of Siena in the UNESCO Representative List of ICH was prepared over the course of 2010 and followed a bottom-up path in that it originated in the multiplicity of “heritage communities” in the Siena urban area.23 Siena represents a textbook case in terms of community participation and awareness of heritage in relation to its collective expressions. In fact, the nomination of the Palio was initiated by the municipality of Siena, the official organizer of the race, thanks to a direct interest on the part of the mayor. However, it was also supported by the Magistrato delle Contrade, the organ that represents the 17 city wards, and by the Consorzio per la Tutela del Palio di Siena, a consortium created in the 1980s to preserve the image of the Palio. Although the actual motivations that led the municipality of Siena to nominate its famous Palio to the UNESCO list were not generated by strictly “cultural” factors but rather (as we will see) political factors, this nomination was, nonetheless, characterized by extensive community participation following the spirit of the 2003 Convention. 32In addition to exploring the complex internal events that motivated this nomination, I am interested in analyzing how the local community interpreted the state’s bureaucratic policies. In fact, this nomination produced conflicts among different bureaucratic state apparatuses that ended up leading to a political crisis, prompting the Ministry of Cultural Heritage and Activities to block the nomination and sparking heated debates in the local community. The Siena case thus reveals the strongly political nature of the bureaucratic procedures surrounding heritage and the overtly conflictual character of the state’s bureaucracies. 33Firstly, the ministry’s obligatory requirement that an inventory be produced using the BDI forms filled out by an external anthropologist was received with some suspicion by nomination supporters, especially given that there is already a truly enormous literature and store of audiovisual documentation about the Palio. Siena residents are highly aware of the heritage value of the Palio; the “cataloguing” anthropologist imposed on them to carry out a bureaucratic task thus represented an intrusion. The entire work of cataloguing was, therefore, necessarily shared with a strong “heritage” community. These were not simply passive informants; they were active heritage agents. 34What most significantly shaped the Siena nomination was the particular political moment in which it was prepared. This moment was characterized by a strategic and conflictual use of “global” values, such as heritage, but also other discourses, such as animal rights and intercultural dialogue. 35We must take a few steps back in time to better understand this case. Several years before the nomination, animal rights movements targeted the Palio on Italian media platforms, repeatedly accusing the event (and the authorities promoting it) of not paying sufficient attention to the health of the horses. According to animal rights activists, the particularly dangerous urban course of the Siena race threatens the horses’ welfare to such a degree that the race should be abolished. Over the history of the Palio there have in fact been several accidents involving the horses, some of which were fatal. In order to address this issue and ensure the continued occurrence (and existence) of the city’s most prestigious public event with its high degree of local identification, the municipality developed over the years a rigorous training and evaluation program for the horses chosen to run in the race, aimed at reducing any possible risk. 36It is not surprising that the UNESCO Palio nomination arrived in precisely this climate of debate and weakness on the part of the administration in relation to the subject of animal rights. International heritage recognition from UNESCO (an occurrence which many Siena residents considered inevitable) would have permanently silenced the debates and erased any doubt or conflict surrounding the health of the horses. By becoming an example of UNESCO-recognized ICH, the Palio (and the mayor) hoped to break out of the tangle of debates that had enveloped them in recent years. 37With this in mind, the “political” motivation that led the municipal administration to present the nomination is easy to deduce: They sought to use a global regime like that offered by UNESCO, with its equally global values, to overcome national debates which were themselves fueled by equally global values (those of animal rights). It is similarly no coincidence that, during the staging of the event that coincided with the nomination preparation, the town hall hired a Lebanese painter to make the traditional silk flag, called the Palio, which is awarded to the winning contrada (ward-based group). This painter created a “transgressive” flag featuring various symbols from the Middle Eastern Islamic tradition24 alongside the traditional Catholic symbols (the race is run in honor of the Virgin Mary) and symbols of Siena’s history, thus provoking anger among the conservative audience members. This was a clear call for inter-religious dialogue, but it also contained a powerful political message from the administration: A clear reclaiming of authority over a territory that has historically been governed by the political left. The deployment of these global values (world heritage and inter-religious dialogue) was intended to symbolically contest and oppose the equally global values claimed by the animal rights activists (animal rights). 25 The Minister of Tourism at the time was Maria Vittoria Brambilla. 38While disputes over the health of the horses in previous years had been marginal to the national debate and limited to the animal rights movement, during the year that Siena was preparing the nomination, these disputes were re-ignited by the Minister of Tourism who had been appointed by a right-wing government opposed to the local administration in Siena.25 The Minister once again raised the issue of the health of the horses running in the Palio on national media platforms, thus provoking a crisis in government relations between two ministries. Following these disputes, the Ministry of Cultural Heritage and Activities decided to block Siena’s nomination without any official justification, even though the dossier did not contain any formal mistakes. In this way, they sought to ensure that the Palio nomination, which had become so highly exposed in the media, did not damage governmental relations. 39The Siena case clearly illustrates how the issue of intangible global heritage in “the UNESCO era” can become the source of conflict between various local and national bureaucratic apparatuses. Local actors defend their interests within the arena of global heritage. In so doing, they must engage in the national arena with other global values and the filter of the state, all of which are factors which may negatively influence the nomination attempts and require that the communities defend themselves in any way they can. The state bureaucracies also display discomfort in the face of community participation and local interpretations of the heritage in question, and respond by enacting bureaucratic centralism as a way of reclaiming authority over heritage policies and over the “cultural property” of the nation, thus hampering local actors and communities whenever possible in their attempts to gain direct access to the global heritage regime. 40Local and national interpretations of the UNESCO convention highlight a dense articulation among contemporary heritage arenas that emerge and develop between local and national settings but within global frames. These arenas oblige communities to locate and make a space for themselves between, on the one hand, the bureaucratic and standardizing language of UNESCO required for presenting a nomination and, on the other hand, the equally standardizing language of national cataloging. Bianco, Carla, and Maurizio Del Ninno, eds. (1981): Festa. Antropologia e semiotica. Florence: Nuova Guaraldi Editrice. Bravo, G. Luigi; and Roberta Tucci (2006): I Beni Demoetno-antropologici. Rome: Carocci. Broccolini, Alessandra (2010): L’UNESCO e gli inventari del patrimonio immateriale in Italia. Antropologia Museale (28–29): 41–51. Cirese, Alberto Mario (1973): Cultura egemonica e culture subalterne. 2nd edition. Palermo: Palumbo. Clemente, Pietro (1982–1983): Folklore studies and ethno-anthropological research in Italy: 1960 – 1980. Ethnologia Europaea 13(1): 37–52. Clemente, Pietro, and Ilaria Candeloro (2000): I beni culturali demo-etnoantropologici. In Manuale dei Beni Culturali. Nicola Assini and Paolo Francalacci, eds. Pp. 191–220. Padova: CEDAM. De Varine, Hugues (2002): Les racines du futur. Le patrimoine au service du développement local. Chalon-sur-Saône: ASDIC. Dundes, Alan, and Alessandro Falassi (1975): La Terra in Piazza. An Interpretation of the Palio of Siena. Berkeley: University of California Press. Mariotti, Luciana (2004): Storia dei processi catalografici. In Arti e Tradizioni: Il Museo Nazionale dell’EUR. Stefania Massari, ed. Pp. 157–180. Rome: De Luca Editori. – (2008a): Capolavori del Patrimonio Orale e Immateriale dell’Umanità. L’esperienza italiana: 2000–2005. Voci. Semestrale di Scienze Umane 5 (Gennaio-Dicembre): 90–104. – (2008b): La Convenzione per la Salvaguardia del Patrimonio Culturale Immateriale. Un’analisi. Antropologia Museale (18): 51–54. – (2008c): Prospettive italiane della Convenzione sul Patrimonio Culturale Immateriale. Ipotesi di analisi tra antropologia e norme giuridiche. In La convenzione per la salvaguardia del patrimonio immateriale. Un’analisi. Chiara Bortolotto, ed. Rome: Poligrafico. Mazzacane, Lello (1985): Struttura di festa. Forma, struttura e modello delle feste religiose meridionali. Milan: F. Angeli. Palumbo, Berardino (1998): L’UNESCO e il campanile. Riflessioni antropologiche sulle politiche di patrimonializzazione osservate da un luogo della Sicilia orientale. Èupolis (21–22): 118–125. – (2003): L’UNESCO e il campanile. Antropologia, politica e beni culturali in Sicilia orientale. Rome: Meltemi. – (2006): Il vento del Sud-Est. Regionalismo, neo-sicilianismo e politiche del patrimonio nella Sicilia di inizio millennio. Antropologia (6–7): 43–91. – (2010): Le alterne fortune di un immaginario patrimoniale. Antropologia Museale (28–29): 8–23. Tucci, Roberta (2002): Beni Demoetnoantropologici Immateriali. Antropologia Museale 1(1): 54–59. – (2005): La catalogazione dei Beni demoetnoantropologici immateriali: le schede dell’Istituto Centrale per il Catalogo e la Documentazione. Voci (1): 51–64. – (2006): Il patrimonio demoetnoantropologico immateriale fra territorio, documentazione e catalogazione. In Beni Demoetnoantropologici Immateriali, Scheda BDI, 2. I. C. C. D., ed. Pp. 20–29. Rome: I. C. C. D.
Vasco Rocca, Sandro (2002): Beni culturali e catalogazione. Principi teorici e percorsi di analisi. Rome: Gangemi. UNESCO (1972): Convention Concerning the Protection of the World Cultural and Natural Heritage. Paris: UNESCO. Zingari, Valentina (2012): Le arti dell’improvvisazione poetica come patrimonio dell’umanità. Antropologia Museale, (28–29): 96–100. Figure 2: The first page of the BDI, the 17-page form for classifying and cataloguing ICH in Italy. 1 The UNESCO Representative List of the Intangible Cultural Heritage was established with the creation of the 2003 Convention for the Safeguarding of Intangible Cultural Heritage (article 16). 3 Current Italian legislation dating from 2004 recognizes “demo-ethno-anthropological” resources as a form of cultural heritage, but does not recognize intangible forms, restricting this recognition to the sphere of tangible heritage. The professional figure of the anthropologist is similarly not present among the Italian state’s cultural heritage personnel (Clemente 1982–1983, Clemente and Candeloro 2000). 5 In relation to cultural heritage policies and specifically UNESCO and world heritage issues, Berardino Palumbo’s ethnographies deserve the lion’s share of credit for introducing a critical analytical approach to the dynamics surrounding heritage policies in Italy (see, for instance, Palumbo 1998, 2003, 2006, 2010). 6 Regarding the implementation of UNESCO policies in the Italian state, see Mariotti 2008a, 2008b, 2008c. 7 Since the Ministry of Cultural Heritage and Activities has not yet granted concrete recognition to the professional figure of the anthropologist on its staff, any anthropological expertise that may be present in the inter-ministerial workgroup appears to fulfill other functions. 8 Speech by the president of the Italian National Commission for UNESCO, Giovanni Puglisi, inaugurating the section dedicated to ICH at Vivere di Cultura: Le giornate del lavoro culturale (Living off culture: the days of cultural work), held June 24 – 25, 2011, Auditorium, Rome (http://www.viveredicultura.it/patrimonio_culturale <accessed 19 July, 2012>). 9 The Mediterranean Diet nomination was presented by Spain, Italy, Greece, and Morocco, and headed by Spain. The nomination was strictly state-initiated in Italy, wholly concentrated on the international promotion of Italian cuisine and put forward on the initiative of the Ministry for Agricultural Policies without any grass-roots involvement by the communities (see Broccolini 2010). 12 The BDI forms are highly elaborate and complex in terms of conceptual organization; they are powerfully regulated and grant significant attention to audio-visual ethno-anthropological documentation; see Tucci 2002, 2005, 2006, Vasco Rocca 2002, Mariotti 2004. 13 The form includes a specific field, indicated with the code ROZ, that allows cataloguers to connect the various different forms pertaining to the same “fragmented” event. This has given rise to a new “bureaucratic” verb used among cataloguers: the verb rozzare, “to roz,” meaning a cataloguing operation in which multiple forms are connected. The use of this verb clearly illustrates the power that bureaucratic procedures exercise in shaping communication. 17 Powerful patrimonialization processes affecting local policies and identity-related claims had already begun at local and supra-local levels many years before, with the institution of UNESCO World Heritage and the creation of the list of UNESCO World Heritage Sites. For a critical ethnographic approach to patrimonialization processes in the field of UNESCO World Heritage nominations, see Palumbo 1998, 2003, 2006, 2010. 19 The ministry’s decision to grant authority over heritage cataloguing to one of its institutes (the ICCD) is due to the fact that MIBAC is the ministry with the most authority over nominations (the dossiers are signed by the minister’s General Secretary) which, therefore, has the power to make decisions about inventories. 21 Network participants include the national association “Città della Terra Cruda,” the Comitato per la promozione del patrimonio culturale immateriale-ichnet, the Associazione per la Salvaguardia del Patrimonio Culturale Immateriale (ASPACI), SimbDea, the Scapoli-based Associazione Culturale Circolo della Zampogna, the Associazione Extra Moenia from Nola (Na), the Venetian Università Ca'Foscari, Università Roma 3, and the Lombardy Region. 22 Project document: Patrimoni culturali Immateriali tra Comunità locali, territori e musei: verso una Rete italiana per la salvaguardia del Patrimonio Culturale immateriale (Zingari 2012). 23 The Palio of Siena is a historical event consisting of a horse race in which ten horses represent the wards (contrade) of which the urban territory of Siena is comprised. The urban territory of Siena is divided into 17 contrade, but, through a complex procedure, only 10 are selected for each race. The race takes place twice a year during the summer in the city’s main square (Piazza del Campo). The first time, on July 2, it is staged to honor the Madonna of Provenzano; the second time, August 16, it is to honor the Assumption of Mary. The race consists of three laps around the track of the square and lasts approximately one and a half minutes, but the preparations and the process of selecting and distributing the horses according to a rigorous public ceremonial is very lengthy. The victorious ward receives the Palio from the town hall; the Palio is a rectangular, painted silk flag that is different every year and which displays religious elements and scenes from Siena’s history. For an anthropological interpretation of the Palio of Siena, see Dundes and Falassi 1975. 24 The painting features Saint George in the guise of a Saracen archer, holding a keffiyeh (traditional Arabic head covering) in the place of a helmet; furthermore, on the Virgin’s crown, there is a Sura from the Koran, with the half-moon symbol together with the Star of David and the Christian cross. BROCCOLINI, Alessandra. Intangible Cultural Heritage Scenarios within the Bureaucratic Italian State In : Heritage Regimes and the State [en ligne]. Göttingen : Göttingen University Press, 2013 (généré le 19 avril 2019). Disponible sur Internet : <http://books.openedition.org/gup/395>. ISBN : 9782821875470. Broccolini, Alessandra. 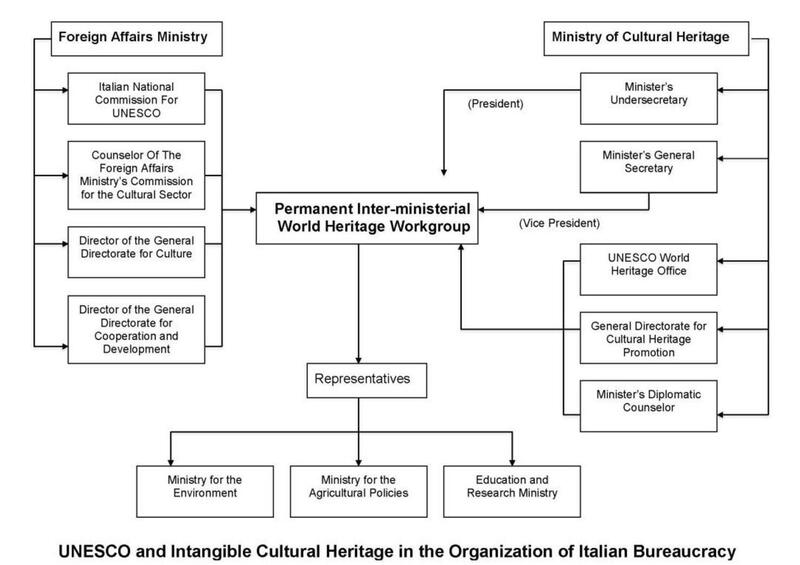 “Intangible Cultural Heritage Scenarios within the Bureaucratic Italian State”. 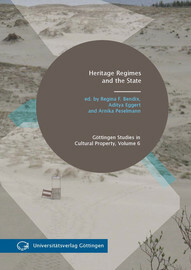 Bendix, Regina F, et al.. Heritage Regimes and the State. Göttingen : Göttingen University Press, 2013. (pp. 283-301) Web. <http://books.openedition.org/gup/395>. BENDIX, Regina F. (dir.) ; EGGERT, Aditya (dir.) ; et PESELMANN, Arnika (dir.). Heritage Regimes and the State. Nouvelle édition [en ligne]. Göttingen : Göttingen University Press, 2013 (généré le 19 avril 2019). Disponible sur Internet : <http://books.openedition.org/gup/348>. ISBN : 9782821875470. Bendix, Regina F, et al., ed. Heritage Regimes and the State. Göttingen : Göttingen University Press, 2013. Web. <http://books.openedition.org/gup/348>.